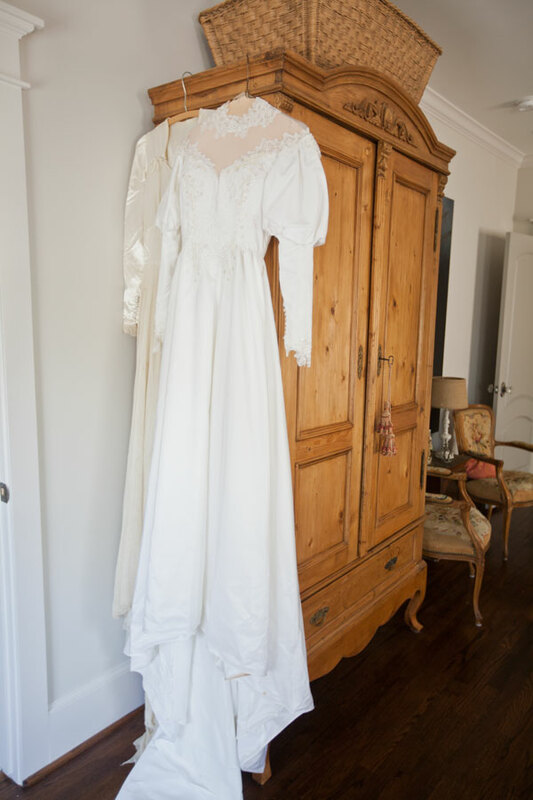 I’ve talked before about how I love to display my mother-in-law’s wedding dress. Well then I thought, why not display mine as well? It may not be an antique, but it certainly is vintage. I got married a little bit after Princess Diana got married. I was still in college. So if the dress reminds you of hers, that’s no coincidence. Two days before our wedding a massive hurricane came straight for Houston. Hurricane Alicia was a direct hit. Most of the city was without power. The day before the wedding the church said they had no power, and they weren’t sure if the wedding could take place. My out-of-town guests had hotel rooms with no water. My parent’s house and my in-law’s house had no electricity. The rehearsal dinner was to take place at my mother-in-law’s house. They had no power. Mr. CH and I had just bought our own little house a few weeks before. It was basically empty, since no one was living in it, and we had no money to buy furniture. Our little house was on the same circuit as a big hospital. That meant it had the power back one, almost immediately. So… the rehearsal dinner was hled out our little house. We filled it with folding tables and chairs. Well the wedding did take place, there was a makeshift reception following the ceremony in the hallway of the church. The whole ordeal was so stressful, I was never so glad to leave town, as I was the next day when we left for our honeymoon. It wasn’t a fantasy trip to the Bahamas. We had spent all our money buying that little house. There was no money left. We spent our honeymoon in North Carolina at the family cabin. Nothing fancy, but we were officially married and finally alone. It’s supposed to be good luck if it rains on your wedding. I’m not sure what it means if there’s a hurricane. And so this isn’t just my wedding dress. It’s a reminder of one of the craziest days of my life. It reminds me that even if everything is falling apart, God is in control, and it’s all going to work out… somehow. Things might not happen exactly the way you want them to, but you’ll make it. 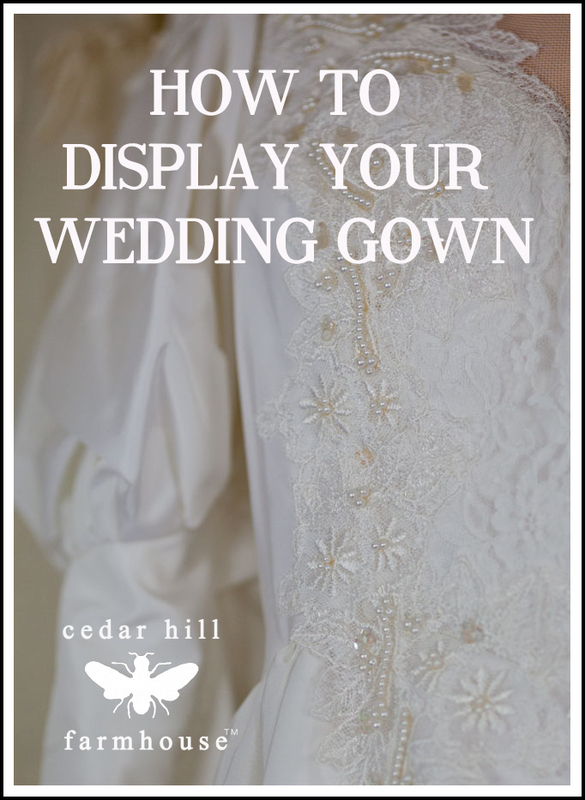 Note: If you are concerned about preserving your gown, seek professional advice. I would not place it where direct sunlight will hit it or where heat will blow on it. If you are concerned, I would not display it for long periods of time. When stored, be sure to use acid-free containers. I am not an expert on the preservation of material. Now there is a memorable wedding event! Something to tell the grandchildren! You sure knew how to motivate your mom! Amazing how different things are today! And you showed real grit in the face of adversity. Good for you. Sounds like a very stressful wedding. Weather is one of the most awful things that can happen. I bet you were so happy to get away. The main thing is a happy marriage – a wedding is a one day affair. I had a beautiful and perfect wedding in Switzerland and Germany. A fabulous 2 week honeymoon in the Canary Islands . Then 2 months later my new husband went to Vietnam Nam for a year. I still have my wedding dress in a box 45 years later. It would be fun to take it out for a while and display it. Great idea! I have just discovered your blog. I want to thank you for sharing your story. It’s amazing what one can do when faced with adversity. I love your About story also. I am a neighbor….I live in Pearland. Hello Debbie, yes Pearland is nearby! Thank you!! I enjoy reading your blog every day. 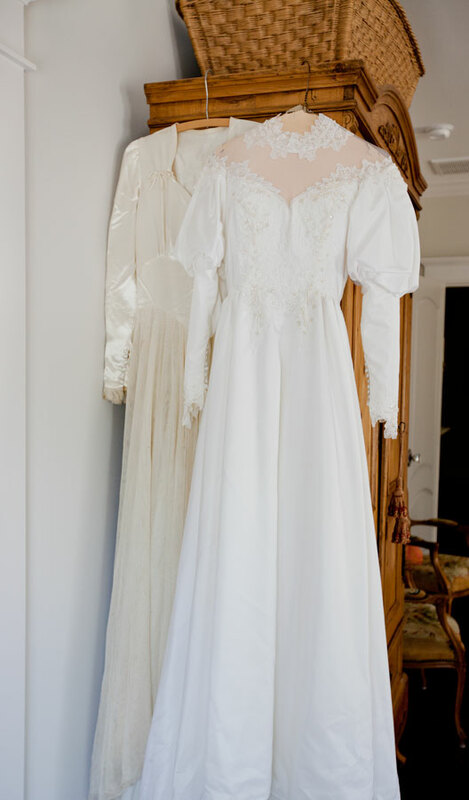 I have my wedding dress on display in my sewing room. It looks beautiful there. I have the headpiece I wore in the built in shelves of our bedroom with my dried bouquet. I love the reminders of the wonderful day! We travelled to CT, very carefully the day after a hurricane. We were told the Inn we were staying had lowered their price by 50%, only to find out that was due to lack of electricity. We did check in regardless. We saw friends, helped with the cleanup, but the wedding was postponed. The venue had no power, as did the bakery for the wedding cake. It was a beautiful day for a wedding but there were too many obstacles. We had an awful storm hit 3 days before our wedding last summer, too! We got married out at a farm and there was over 8 inches of standing water in the ceremony space and where the reception was supposed to take place. They got it pumped out and it was still a little soggy but at the end of the day we were married and that’s all that mattered! Nothing like that kind of stress though to remind you that you’re not the One who is in control! Glad you were able to go through with the ceremony Amanda. Beautiful gown. It reminds me of my own in places. I guess we’re true kindred spirits, since a hurricane landed on my wedding day, as well, although the fallout wasn’t anything like yours. We were actually able to have a wedding with no rain (beautiful evening for outdoor wedding), but the honeymoon got a little rained on for sure. Hi Anita, I shadow boxed a lot of my wedding pieces down to a pair little favors. I also displayed my Princess Di very full type dress for a short while it just took up to much space. I ended up taking it apart knowing I would want not to pass it down and a daughter someday would have here own dream dress. With taking it apart I added it into pieces to decorate with. A baby quilt for a crib someday, and what a beautiful vintage comforter that quilt was displayed later in a beautiful pewter iron crib with shade of grey, blacks and white and black and gold framed English rabbits. I still have the quilt from my dress looking aged perfectly. 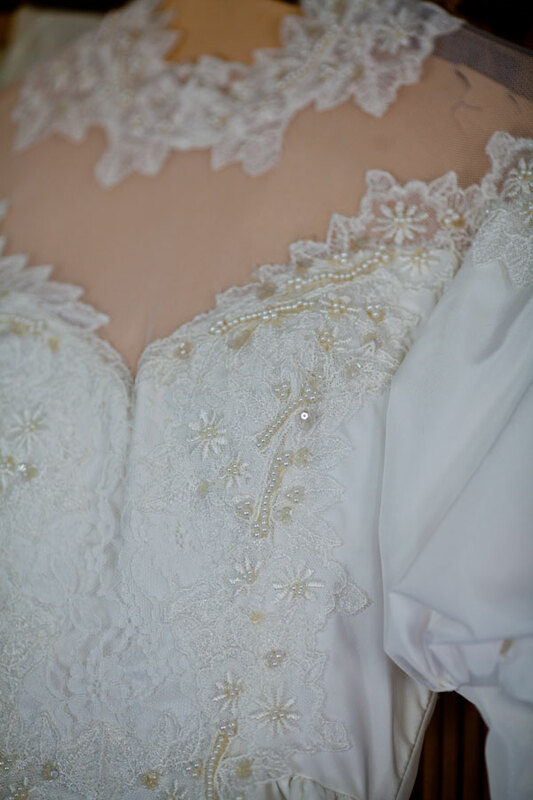 I also took the embellishments off the dress, bow, rosettes, buttons, snippets of the dress and stored the pieces in a beautiful box with the invitation, napkin, favor, cake topper and so on….All neatly tucked away. I also love the bridle head pieces displayed hanging or if small then under a cloche dome filled with jewels from the day. 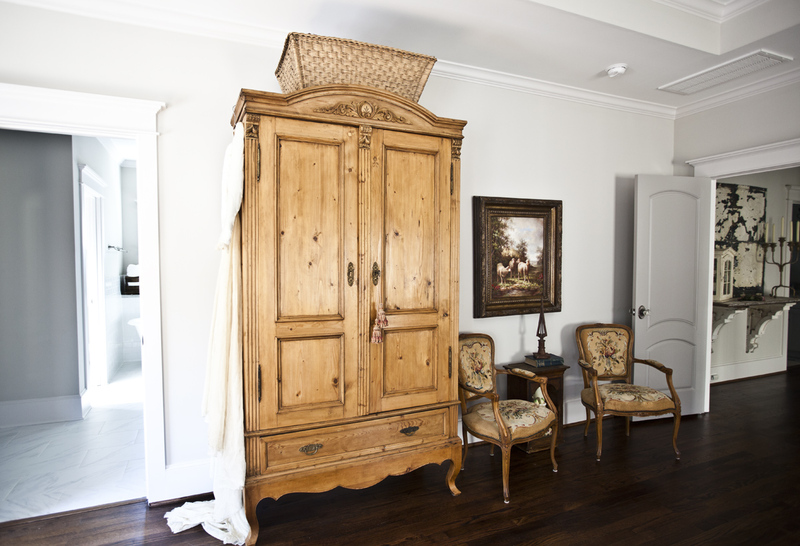 I can see both dresses hanging off the armoire and how endearing is that. As for the honeymoon, it sounded wonderful, and knowing you had a starter home to come home to makes it that much more amazing. Blessed you are, and so true, God is in control, he is so much bigger then mans junk! 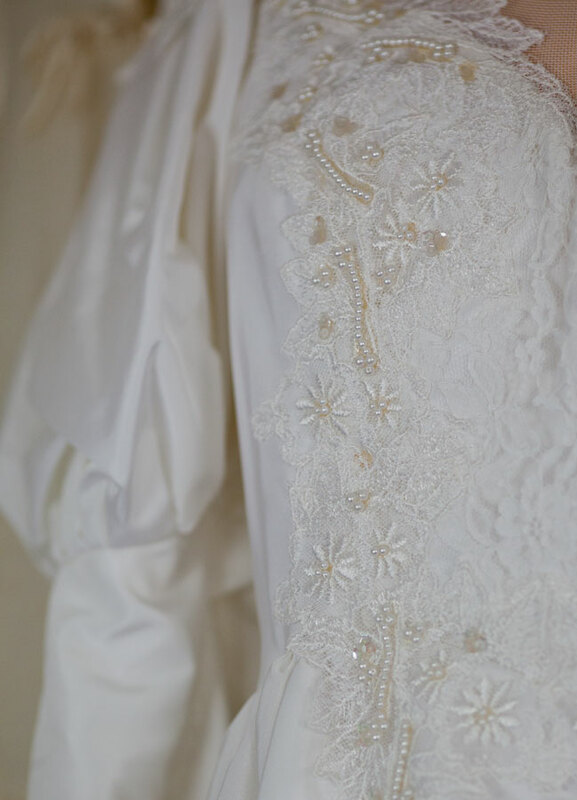 Anita, I would say that your tenacity to make the wedding happen spilled over to your successful marriage and family life….you make things happen in spite of any road blocks you encounter…Love your beautiful dress!!! What memories!! One of my college roommates was married during a snowstorm. it started snowing hard on Friday morning, so we all got there as it was beginning to stick. The rehearsal was cancelled and we had a family supper that night with about 10 extra guests. The wedding was the following day and we were chauffered in jeeps to the church, wearing our bridesmaid dresses. Hardly any guests came, but it was a beautiful event. I always said I would never marry in December, but guess what… my anniversary is Dec. 19. Fortunately there was no snow, just a beautiful day. My gown is the same era as yours!! I’ll have to pull it out and display it like yours. That is cool Nan. Would love to see yours! !